Glenda Collens (nee Thomas-McSween) holds a Bachelor of Music in Voice Performance from Boston University. 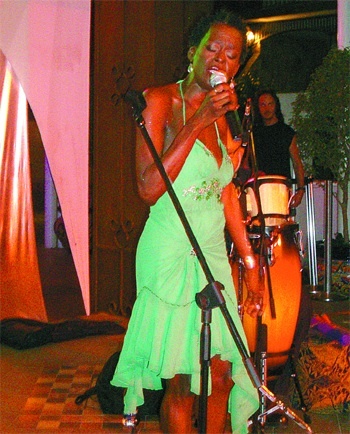 She began performing at a very early age and remembers her first performance being on the Aunty Kay show at age 7. Her next major performance was at the Vienna Music Festival at age 15, as a member of the combined school choirs of Holy Name Convent and Queen's Royal College, under the direction of Michael Steel. She continued performing in the classical music arena throughout her teenage years. As a young soprano, she went to New York to study music at Manhattan School of Music and Harlem School for the Arts, where she studied voice with Ms. Betty Allen. She was a member of the choir Belvedere and the Trinidad Opera Company, competing successfully in the biannual Trinidad and Tobago Music Festival, where she was awarded many first, second, third place and championship prizes. 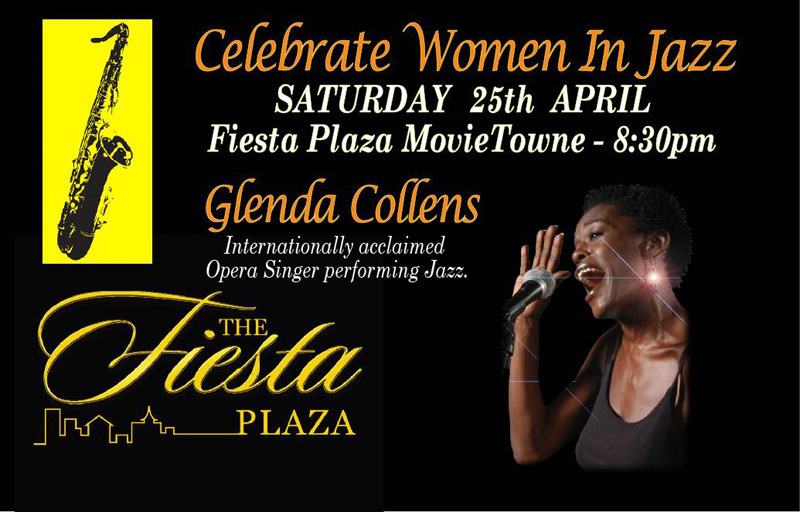 Women in Jazz 2014 ended on a musical high at Fiesta Plaza in Movietowne, Port-of-Spain on April 26 with Glenda Collens confidently giving her own voice and interpretation to several jazz standards and original compositions. It didn't take long to find out that this was going to be a unique concert, an adventure into the world of a well-honed musician who holds a Bachelor in Music in Voice Performance from Boston University, and has been featured in solo recitals in London, France and Italy, and in many of Rapso group 3Canal's Carnival productions, as well as her own production Swing Out Live which was nominated for six Cacique Awards. "Your first impression of Glenda Collens is of a beautiful woman that is deeply focused and determined. Her smile is catching and her voice, that signature tool that she wields like a skilled craftsman and uses to deftly coax other voices to come to the fore is a major part of her identity, an identity she almost lost and found again." 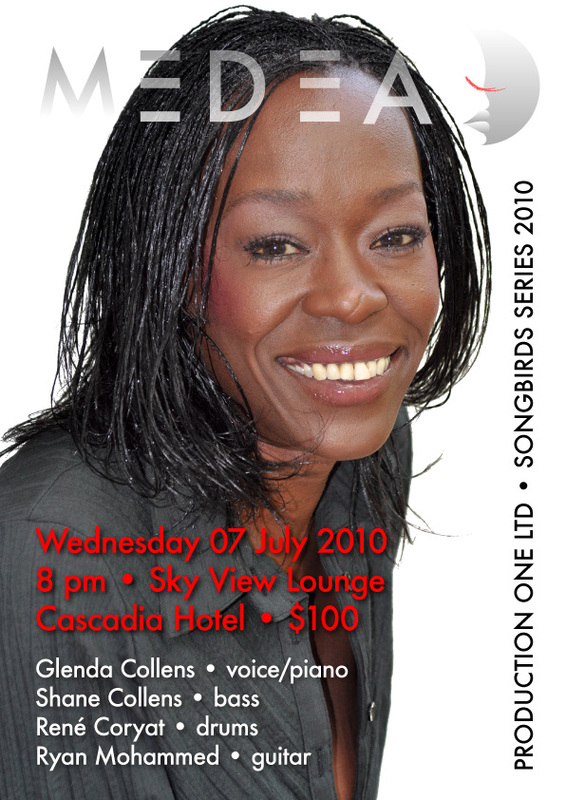 "Glenda Collens on July 7, a hard-hitting judge at last year’s Digicel Rising Stars Competition, demonstrated that she practised what she preached, as she entertained the small but appreciative crowd at Cascadia’s Sky-View Lounge. She was accompanied by her husband Shane Collens on bass, Ryan Mohammed on guitar, and Rene Coryat on drums. " 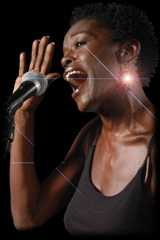 "This prodigious entertainment polymath  singer, vocal coach, choir director, musical theatre producer, arranger and conductor  and former Digicel Rising Stars judge, far from being unheralded, will be showcased in a new light where the solo voice of the Caribbean female vocalist is emphasised. Her clear voice can turn the ordinary song into a deeply moving and individual piece that reflects her continuing journey as an entertainer in Trinidad and Tobago. " "When Glenda Collens returned home to Trinidad in 2000 after pursuing her music degree abroad, it was with a strong determination and the intention of producing her own musicals and stage productions. Nine years later and she has accomplished those goals through the establishment of her own production company and a critically acclaimed band." "Award-winning musical director and voice coach Glenda Collens has joined judges Johnny Gonsalves and Michael Salickram for the series, which is being hosted again by Knycky Cordner." "The shortened audition period is not the only exciting change that will debut this season. Award winning musical director and voice coach, Glenda Collens, will join long-time Digicel Rising Stars judges Michael Salickram and Johnny Gonsalves to lend her expertise on a celebrity panel. " 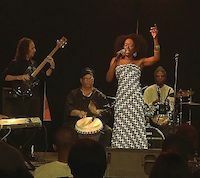 "It is a pity that so few got to experience Jazz in July, which featured headline act Cheryl Pepsii Riley, last weekend. 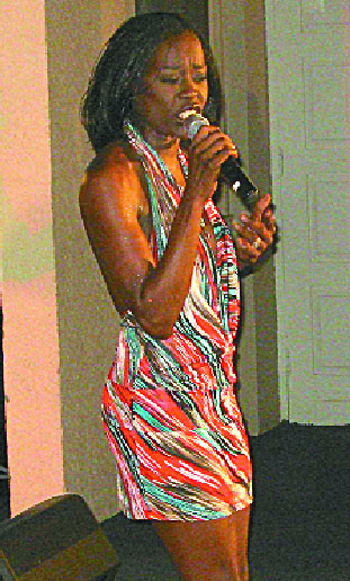 Presented by Victory International and held at the Queen’s Hall, St Ann’s, on Saturday and Sunday nights, the show also featured the likes of Vaughnette Bigford, Glenda Collens, Theron Shaw, Dane Gulston, R’kardo St’von and Mungal Patasar. The empty seats in the large hall were hard to miss. But what the show lost in patrons it certainly made up for in performance." "Glenda Colens took the plunge with a Nat King Cole classic: Native Boy, setting the tone for a playlist strong on passion. The House of the Rising Sun saw her visibly and vocally relaxing and allowing her powerful contralto some of its range. By the third number, Carole King’s ‘It’s Too Late’, she had been joined by David Mohammed on piano and by husband Shane Collens on bass." 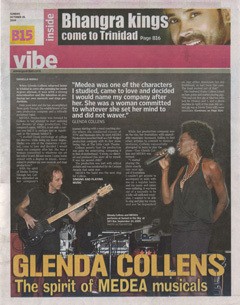 "Glenda Collens has impressed people all over the world with her magnificent voice for many years and when tuberculosis threatened to cripple her career 11 years ago she faced the odds and fought back returning to the music scene even stronger than before." 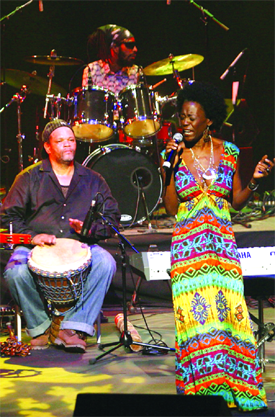 "The month of April has become synonymous with jazz in T&T. In keeping with this, Fiesta Plaza has taken the opportunity to showcase the country’s finest female jazz performers at Divas of Jazz, featuring Chantal Esdelle and the Band Moyenne, Glenda Collins and the ever powerful, Mavis John."